Janet's Art Play: Whatever happenedd to 2016? I have been absent for awhile. Life just got in the way. I have been making art all along, so in the next few weeks I will get you caught up on all the new paintings. I think this week I will start with the Babushkas. 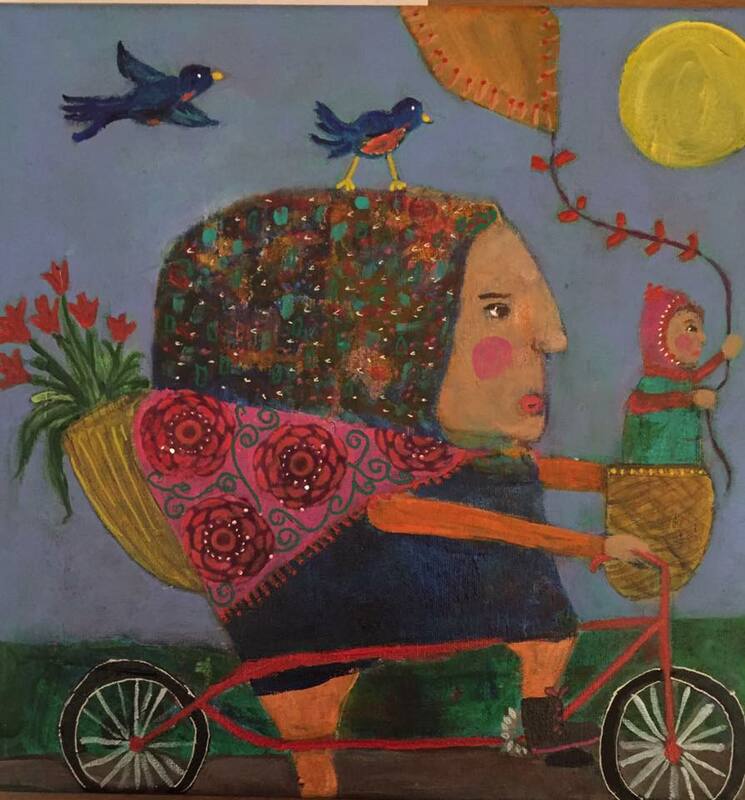 First up is "Babushka on a Bicycle". She looks very determined doesn't she and I love the baby babushka with her kite! She was so much fun to make that another babushka seemed to be order. I named this next one "Babushka Tiptoes through the Tulips" for obvious reasons. I love the baby babushka. I think there are more babushkas in my future! What fun and you have been busy. Lots of fun gong on here and I agree what happened to 2016 ? So nice to see your art work again. I love your style. It is so distinct. If I went to a gallery, I would immediately know which one was a Janet Ghio. Wow Janet I love these too, I think I need to go back to just arting and blogging!! Oh Janet, welcome back friend! I've missed reading your posts and oooing and aaaaing over your wonderful artwork!I absolutely Love the babushka's!and I wish my folks were here to see these, I know they would love them as well! Your new blog look is fab,love the background! Looking forward to more of your art- welcome back! I add an 'amen" to the above comments. Missed your postings and hope we can look forward to more this year. Oh my goodness your characters are amazing!!! I just LOVE your style so much! Wonderful blog! !